Yes, winter is officially here. The snow is blowing outside, the sidewalks are icy and I’m resisting the urge to go into a hibernation mode. 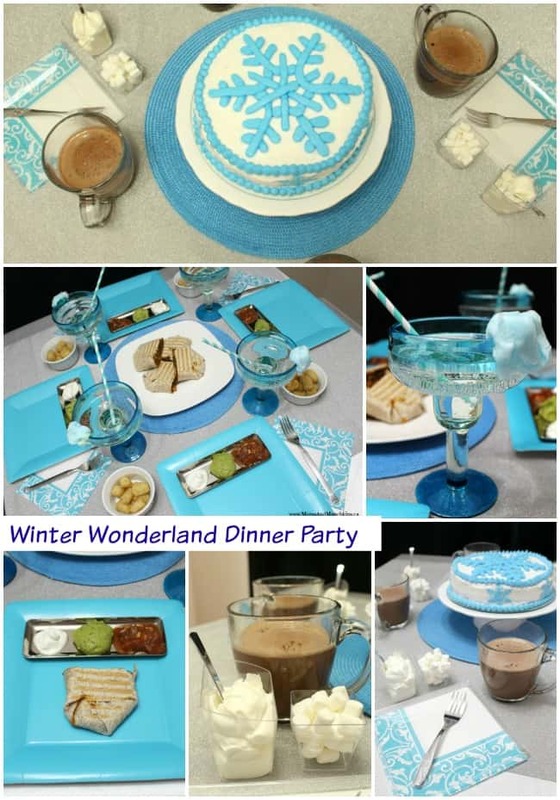 Rather than hide under a blanket waiting for spring, I thought I’d celebrate winter instead with a little Winter Wonderland Party. I’m excited that my party ideas were featured in Pink Magazine SK – read the full article for decorating ideas, activities and more! Here I’ll share a few dinner party photos with you but the article is loaded with ideas including both indoor and outdoor games. I recently took a cake decorating class so I thought I’d take a shot at making a cake for the party. 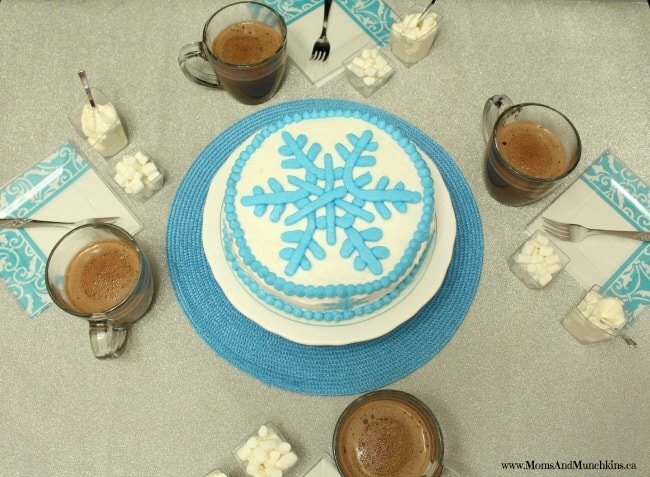 Using Shayna’s buttercream transfer tutorial, I attempted some snowflakes for the top and side of the cake. Not bad for my first attempt but I could still use some practice…while eating all the flops of course! 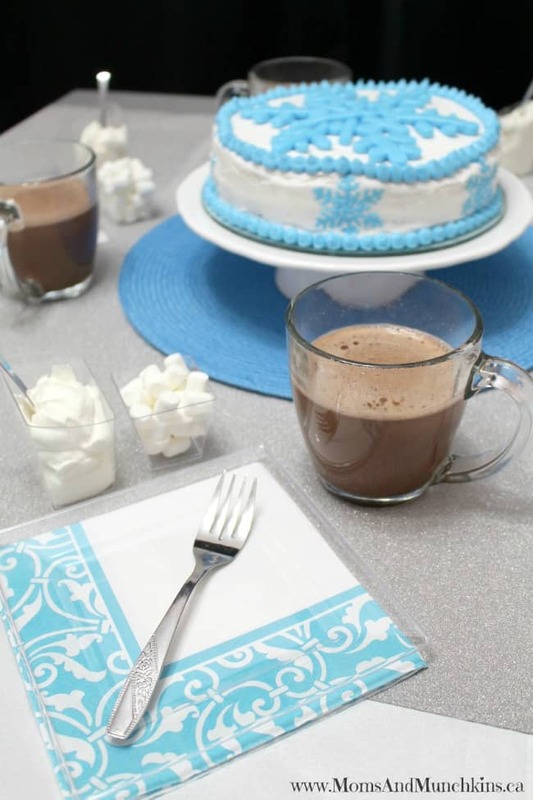 A winter-themed party wouldn’t be complete without some hot chocolate. 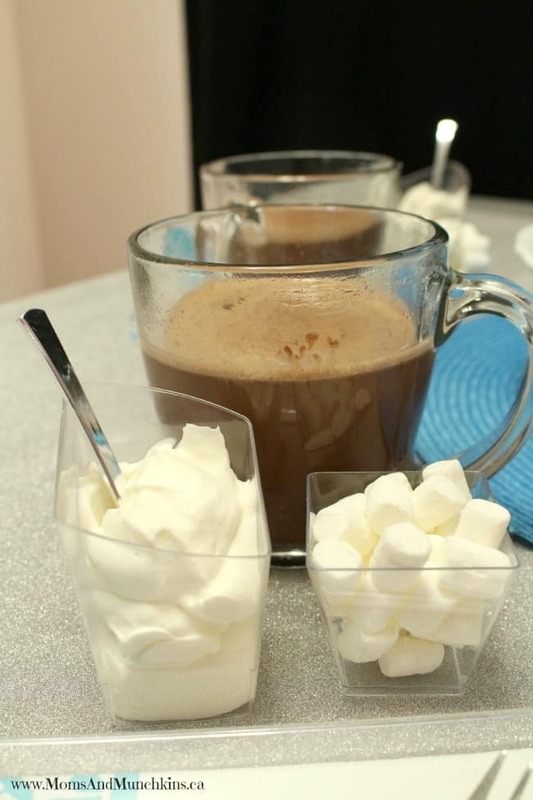 I used some appetizer dishes from Party City for mini marshmallows and whipped cream for each hot chocolate. When I was a child, my mom used to make us buttered toast strips to dip in hot chocolate after a cold day playing outside. It sounds a little gross now but it was one of my favorite treats back then! 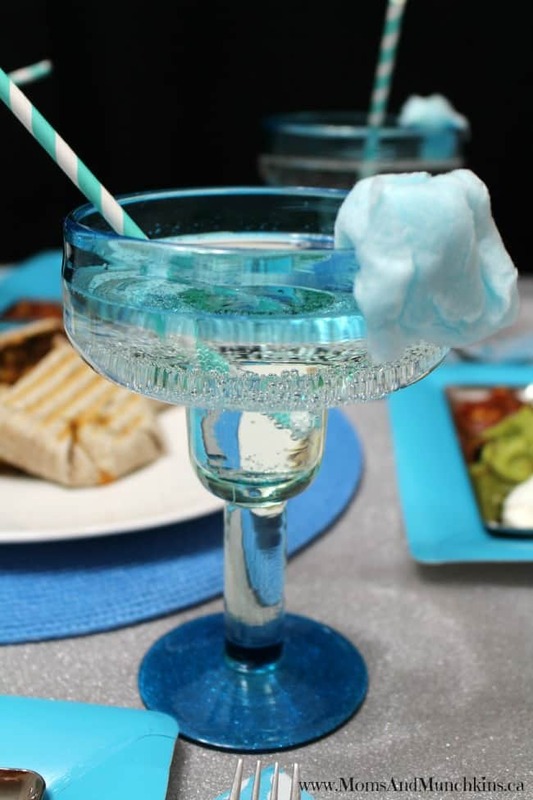 For a cold drink, a simple pop in a fancy glass garnished with cotton candy is a delicious choice. I love paper straws and I think they make any drink look adorable! 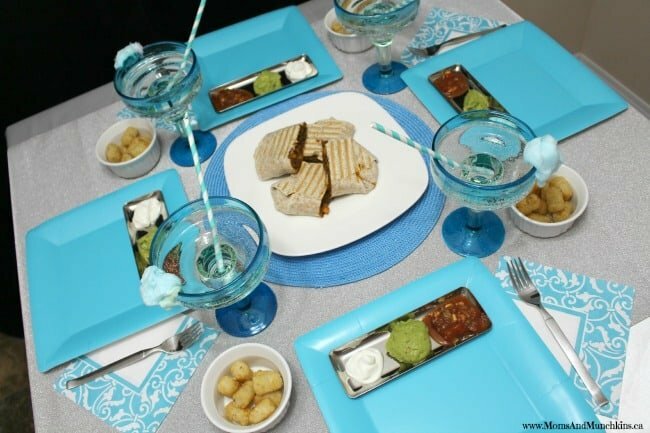 Any food would be great in a winter-themed party. For kids, I keep the options basic because I know most are picky eaters. For an adult dinner party though, I’d dig into my recipe book cabinet to try out a new meal. 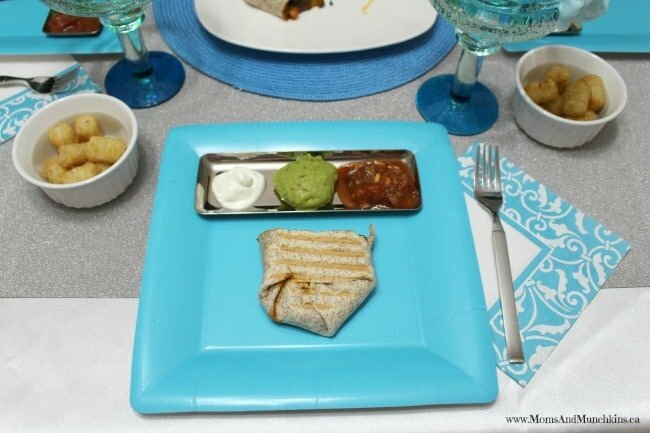 The silver appetizer trays here are from Party City as well. It’s a cute way to display the dips or a side dish. Don’t forget to head over to the full magazine article for all the party details, game ideas and more! For more parties, visit our Birthday page.